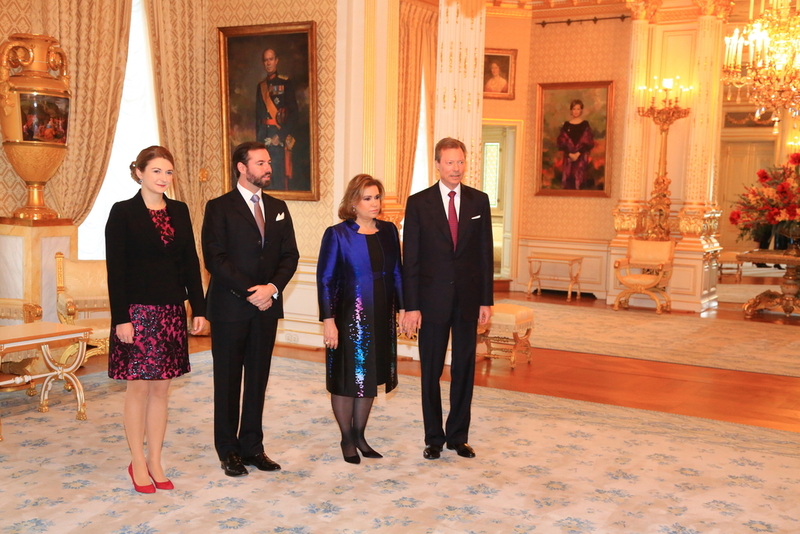 This morning, there were two New Year's audiences at the Palais Grand-Ducal, with Grand Duke Henri, Grand Duchess Maria Teresa (wearing Armani - thanks Avery! ), Hereditary Grand Duke Guillaume, and Hereditary Grand Duchess Stéphanie (in Diane von Furstenberg, again) in attendance. During the first audience, the President of the Chambre des Députés and the Bureau of the Chambre des Députés were received. During the second audience, one hour later, Prime Minister (and Minister of State) Xavier Bettel and other members of the Government were received. Some really nice photos at RTL and Tageblatt. Also, a video from RTL is now available.